This article is 1930 days old. The Arts Council Windsor & Region is holding it’s first ever “Back to the Drawing Board” community think tank for artists and arts organizations. 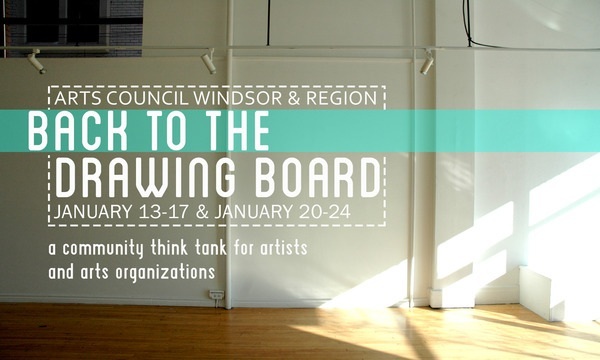 Back to the Drawing Board is a two week long artistic think tank open to the public that focuses on creative development and communication within the arts community in the Windsor and Essex region. It is geared towards artists and arts organizations of all disciplines. Participants will visit the gallery space during the two-week period and contribute to large mind maps and community calendars. Upon the final days of the exhibition, the gallery will be filled with ideas, plans, and source material to further arts communication and growth within the community. Whether you are an individual artist who seeks guidance and community connections, or an arts organization/ group who would like to widen your audience, “Back to the Drawing Board” can help you in the right direction. The event will take place from January 13th to 17th & January 20th to 24th from 1pm-5pm. The two weeks will finish with a discussion night in the gallery on January 24th @ 6:30pm-8:30pm.